Jan 6 - I'm only letting you know we are still alive. We spent the week finishing up the house which means cleaning up edges and removing screws before un-screwing the 5 billion 503 thousand 6 screws from the walls. Yesterday, after we finally got the last of junk to the dump (over 5 tons or 10,000 pounds for the non-conversion people) we finally spent the day cleaning. Not the real deep cleaning, the cleaning that we did with a garden hose and the wet vac. We got lots of dust off the floor and it was way more that I thought we would have gotten. Today we took the entire day off! Yes, I needed a break and I needed to go see a friend up in Okeechobee. We had a great day and a much needed day off. Next we will be cleaning with chemicals and the cleaning will include the washing of walls and all of the studs in the house. That is a good two day project and then we will do a big time scrub of the floors and tiles. After all that scrubbing it is time to put the place back together again. I'll start taking pictures again but the bottom line is that they didn't show much. Still, this is a boring site if there aren't pictures and better updates. Thanks for still keeping up with us! Oh yeah, I almost forgot - the smell is 99.9 percent gone. Get rid of the cancer and the body gets better - get rid of the chinese drywall and the house says Oh Yeah!!! This hasn't been the biggest mistake of our lives, instead it has been a great adventure and I've even lost 6 pounds in the process. Don't you love work or should I say exercise and not use those 4 letter words. Jan 12 - Boy we wish we were still cruising! It is more fun!!! We've just been working our tails off for the last week. The house has now been scrubbed from top to bottom and it is very clear that the work is paying off. This is probably the cleanest this house has ever been with every stud washed along with the insulation and floors twice. The picture you see to the right is a picture of the master bedroom's walk-in closet. I can hear you now - Jim, is this the best thing you can take a picture of? Truthfully, it is. This is an example of what I've been thinking about. You see, if you buy a house and the walls are all up, then if you want a custom closet it has to be with shelves on the outside of the walls. 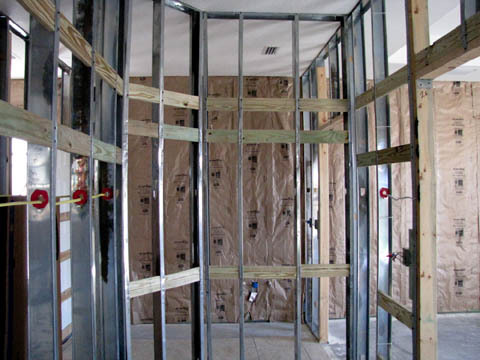 If you don't have drywall up, then you can put backing boards inside for your customizing. What you see to the right is the backing boards for the high shelf, and also the hanging rods. One is for longer clothes and you can also see where there will be two rods and we also have boards for additional shelves by the door. Overall, we will have more space than we've ever had in a closet and just think, the only clothes we have are on the boat. Let's just say we have room for expansion! I almost forgot, Deb's side has here clothes rods set lower just for her height along with some extra shelves for shoes even though she only has 3 pair now. I'm sure she will pick some more up at garage sales. Then there is the closet in the 2nd bedroom. Since we will only have people stopping by to stay a few nights in the Faughn Hotel, then we really don't need big closets. So, this one is where Deb will be making her jewelry. I've added a high backing board for additional storage to again make advantage of those 9 foot ceilings. Then the partial low board is for a desktop that will be hidden in the closet. In the 3rd bedroom with the bay windows, I've done something similar for a complete desk. This will be in place of a desk out in the room. I've designed a space that will have a couple of low file cabinets along with high storage that I can use for a desk along with guitar storage on the ends. It will be nice if somebody stops by to just close the closet and everything will be cleaned up or at least out of sight. We have also agreed where the TV will ultimately be whenever we can buy a current model which will be about a year from now. I'm putting a bunch of plywood in the wall for the living room to mount the TV on whenever the time comes for us to actually mount one. But on to more interesting things. 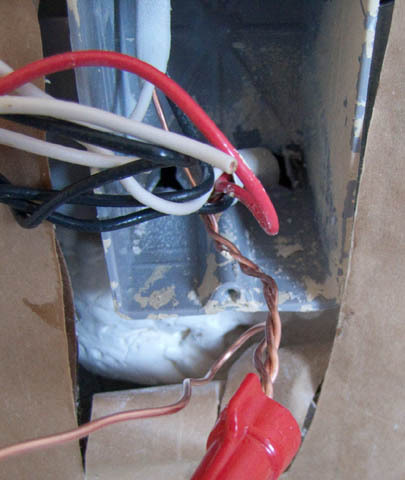 Not only does Chinese Drywall stink, it also puts off a gas that attacks copper. That impacts things like your Air conditioning, copper in plumbing, along with your electrical wiring where the copper is exposed. 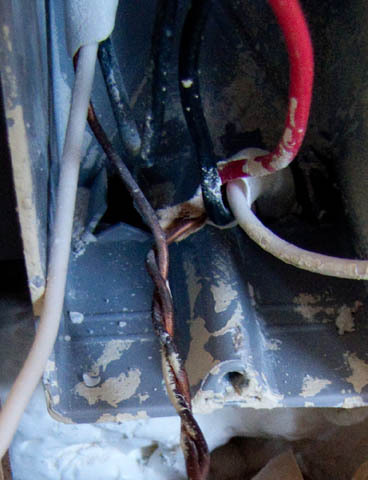 For example, the ground wire is very exposed along with the hot and neutral wires where they have been stripped and twisted together. If you look at the picture to the right you can see the inside of a wire nut that has corroded from the gas. Remember, this house is only 3 1/2 years old! For those who are electically challenged, this means a bad connection and that means heat - in other words, it could cause a fire or bad power at the least. 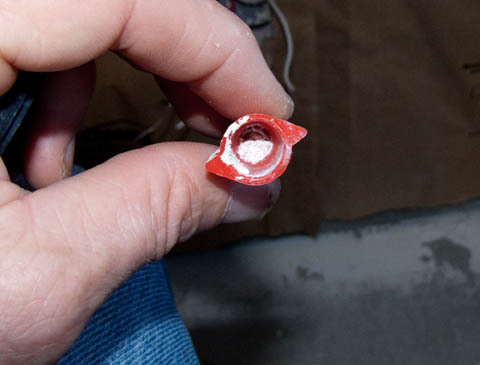 You can now see why every single switch and outlet must be replaced along with every wire nut. On top of that, all the wires had to be cut back and then re-stripped for new installation. The ground wire, which you can see below, has to be cleaned and brought back to new condition. I've chosen this method because we really didn't have that bad of corrosion and you can't see any damage on the wire once the black has been cleaned off. In the example to the lower left, you can see the corrosion on the ground wire which is about average in the house. Other places are worse and some have no corrosion at all. To the right, you can see the cleaned up ground which looks like new. Another interesting thing is that the wires that were in the ceiling show no signs of corrosion at all. This is very good for us and I will just replace the wire nuts for safety sake on the ceiling lights. I was asked in an email about how to recognize chinese drywall from the painted side. I don't know of a way you can tell. That is the problem. You really don't know what you have until you tear the house apart. In our case, I knew the ceiling was 5/8ths drywall which was not made by the Chinese so I knew it wasn't going to be a problem. However, what about the drywall in the walls? As you already know, most of ours was U.S. drywall but I didn't know which ones until I tore it down. (Over 5 tons taken to the dump.) The other thing I learned was they built the house wrong and did not put in the fire rated drywall in the garage. Of course I will be changing that when we reinstall the drywall but who would have known? This is something that is supposed to be checked by inspectors but unless they are there when it is put up, how would they know? Yes, they could measure it but sometimes they have to trust that the builders are doing the right thing. In our case they didn't but it doesn't matter because I'm re-working the house. I also found some other wiring issues and will be adding a few boxes where they should have had some. Let's just say I'm pleased that we are now able to look at everything and get going on the rebuild project. It appears at this point that we will be calling for the rough-in inspections next week sometime between Monday and Wednesday. That means we may be getting the drywall installed as early as the following Monday, only a week and a half away. I still have some details to work out such as security system and dock wiring but that will simply keep me busy keeping up with the project. One more thing, we've also received news that the sailing endorsement I wrote was approved by the Coast Guard. That means True Course, the company I teach Captain's Classes for, can now offer the Sailing Endorsement as one of their classes. Now that's cool. Speaking of True Course, we will be doing some more video work next week for the on-line class or at least it will be done in Ft. Myers. I'll be hanging around some but my time on camera was completed in Hilton Head. The course is coming along and hopefully will be ready to roll out in the Fall. Well, maybe more than one more thing - finally, I'll be taking some time away from the house project in February to teach a class in Alabama. It will be everything from the O.U.P.V or better known as the 6-pack, the Masters, Tow Endorsement, and now the Sailing Endorsement. It will be a good break from the house and I should return re-motivated to finish. Of course if all goes according to plan the drywall will be up and finished before we leave for the class. I'll try to keep you up-to-date and make this more interesting too. I'm still amazed people are still checking out the website since we have stopped cruising full-time. Hope you have a wonderful new year and also you enjoyed yesterday which was 1-11-11. Jan 27 - Work has been progressing very well at the house. We completed the cleaning of all of our wires and received our inspections for the house about a week ago. We were approved for closure after the electrical, plumbing, and insulation inspection. That was good news so it was time for the drywall contractor to come in and start hanging drywall. They actually started on Saturday and have been working every day since. 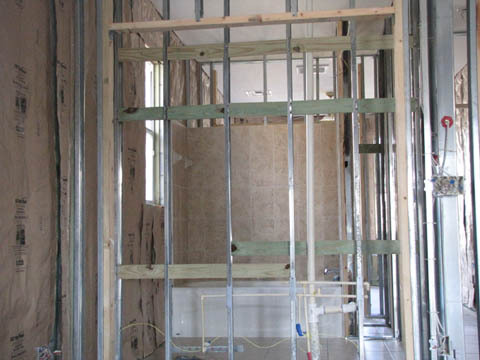 They have almost finished the taping/mudding process and it looks like that will be completed early tomorrow and then they will begin texturing the walls. They will probably be finished by Saturday with their part of the cleanup which won't be much. My part should be finished following them and then I can use the house for my preparations I want to do for the upcoming class. Looks like the project will be on hold until the end of February when we return. My guess is that it will take about 5 weeks to get the house primed and painted, floors for the 3 bedrooms installed in tile rather than carpet which I will do even though I've never done it before. Then install the electric, finish the plumbing, install the trim then caulk everything and finally paint everything one last time. Lots of work but at least it is all constructive. On a good news front, today I got the A/C working by talking to my neighbor who is an AC guy. I knew what part I needed but they won't sell it to me in Florida. What's up with that? He had a run capacitor, which had been taken out of my AC system, so it got installed. He was nice enough to help out even though I knew what it was I was doing. He also told me there was an apparent leak in the system which he had filled several times. Looks like the Chinese Drywall may have hurt my evaporator coil in the attic. Oh well, just something else to add to the list and I won't need a permit to repair the system. We will look into that when we get back from Alabama at the end of February. For now, everything is ahead of schedule and once again I'm not putting enough pictures in this update. Bottom line is it looks like every other house getting built. It just happens to be my house. Oops I almost forgot something funny. When they were putting up the drywall in the master bath they screwed 3 screws into the hot water line. Now that was a problem and they came running out of the house yelling at me to turn off the water as I was mowing the back yard with my "new to me" electric lawn mower. Ok, for all of you up north I'm sorry that I am so warm down here. Back to the story. They thought they had only hit the water line twice. I took off to pick up some couplers and picked up 4 just in case rather than buying just 2. I got back and they went to lunch after taking the drywall off the wall and exposing the pipe. I fixed the two places and then turned on the water only to come back into the house with water spraying everywhere. Running to turn off the water and then back into the house to flush the toilet to remove the pressure. There was one more leak to fix. After I glued that up then all was good. They returned and put in the rest of the drywall as I dried out the wall with fans. It was good that I'm a pretty good plumber in addition to a few other skills. One other quick story. We had no appliances and weren't really interested in buying some yet. However, we came across a deal on Craig's List that just couldn't wait. We picked up a side by side refrigerator, stove, dishwasher, above stove microwave all in black for $500. Not a bad deal for the 6 year old high end equipment. We picked it up and still have two of the appliances in the back of the van because of lack of space. Hopefully we will be able to unload them by Sunday.